Once a year I treat Northern Steve to a proper Non-League day out. None of this Conference Premier malarkey that we had at Lincoln City a few weeks ago. Proper Non-League. The trip is essentially a thank you to our respective wives (The Current Mrs Fuller and The Current Sister of Mrs Fuller aka CMF and CSMF) for our absence in the past year when we should have been doing stuff around the house on a Saturday. So what do we do – we take them somewhere far away from home, take them to a bar, buy them a bottle of Rose and we go to football. They are so busy chatting they don’t even notice we’ve gone… In the past few years we have taken in the cultural delights of Hucknall Town, had a tour of the top ten things to see and do in Farsley expertly led by David Hartrick and last year went to the Home of Football, Sheffield FC. This year it was my turn to choose, so I reached deep into the cash reserves to give them one special weekend away. “Ladies…we are off to the market.” Squeals of delight follow as they start thinking of The Grand Bazaar in Istanbul or the Spice Markets of Marrakesh. Squeals of horror follow when I tell them it’s the Bigg Market, Newcastle Upon Tyne. I tried to sell the advantages to them – “You wont have to take any clothes with you – just a short T-shirt for a night out”, “You don’t have to stagger far from hotel to bar and back again”, “It’s far enough away from the children that our mobile network might not hope”. Slowly they came around to the idea although the deal clincher was the fact the football on offer was a Northern League Division Two local derby. We had them at Jarrow Roofing Boldon Community Association Football Club. What more could a girl want? A top of the table local Tyne and Wear Derby in the 10th tier of English football on a cold Winter’s afternoon in a former pit village? “Take Metro from Central Station seven stops to Brockley Whins, cross the bridge and keep on walking – the road will be on your right”. Simple instructions you would think. What Andy Hudson had neglected to mention was the bit between leaving the bridge and reaching the ground involved traversing the assault course from The Krypton Factor AND Wipeout. You know when you watch a crime drama and the opening scene always starts with someone talking into a voice recorder saying “Victim. Male. Blunt trauma injury to the head”, well the route to the ground must pass through the locations they all use. Once we had negotiated a 30% decline, and the corresponding incline, puddles the size of Andorra and a fair few rabid dogs (not to mention a sofa that DFS could probably resell), we found the ground. Except it was completely deserted. Game off perhaps? Thanks Andy for not telling us! We were in the process of planning a less dangerous route back to the metro station when a car pulled up. “Going to the game lads – keep on walking”…it appears we were peering into the ground of Boldon Colliery Welfare FC (their tale is expertly told by Michael Hudson here). Andy had made a high-profile move across the Newcastle suburbs in the summer from Hebburn Town taking with him the manager Paul Bennett (or was it the other way round? ), running the virtual presence of the club in expert fashion. Ten years ago the club had reached the semi-final of the FA Vase and he shared with me his dream of walking out a Wembley Stadium one day with the Roofing, wearing a cheese-shaped hat and waving a bit yellow and blue rattle. It beats some of the other dreams he has shared with me in the past on our numerous forays into foreign lands (A book called The Football Tourist, written by erm…me, documents many of these trips). The club couldn’t have been more welcoming. From the lady behind the bar who told me that “we don’t get many of you to the dozen” when I answered her question as to my origins, the presence of the League’s Chairman, and author of the excellent book Northern Conquest, Mike Amos who regaled us of his tales of his last visit to The Dripping Pan to the rarely spotted chilled bottles of Double Maxim brought in especially for me. With no game this weekend, FC United of Manchester’s top media man, Swampy, was also in attendance and we were soon swapping stories of Community Share issues, new stadiums and fan-ownership governance. With stories abound in the media this week about owners overstepping the mark (when don’t they?) it reminded us of the sheer beauty of fan-owned football clubs. Just before kick off we were joined by Dave Hartrick, publisher of that book The Football Tourist, written by…erm me, who had apparently told his wife he was popping out to the shops to get some milk. He lives in Huddersfield. Never one to miss a Northern Steve weekend (this was his third successive trip), he simply couldn’t miss the hospitality, the chips with chilli on or the prospect of a rip-roaring top of the table clash. To say that this is the 10th step of English football is to do it a disservice. It takes a bit of explaining as to why the Northern League is a little different to other leagues. You only have to look at the list of the winners of the FA Vase to see how strong the league is. In the past five years the trophy has made its way back to the North East and Northern League clubs. Whitley Bay completed a hatrick of consecutive wins in 2011. The following year the final was between two clubs separated by just 30 miles down the A1 in West Auckland Town and Dunston UTS. Last season Spennymoor Town capped off a memorable season by winning the trophy at Wembley against Tunbridge Wells after finishing as runners-up in the Northern League to Darlington 1883 with a remarkable 100+ point haul. 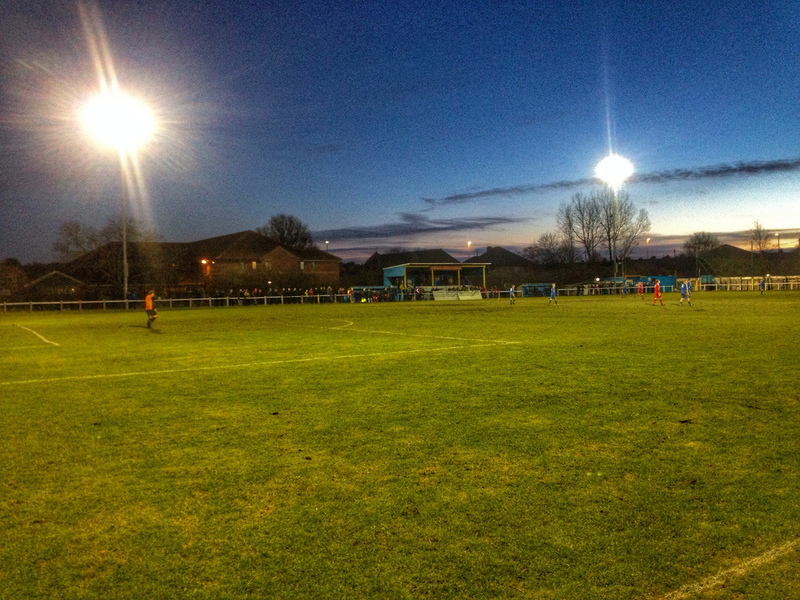 Many clubs do not want or aren’t simply geared up to move from the Northern League to the next level up (currently the Evostik Northern Premier League Division One) – travel costs increase dramatically, the lack of local derbies reduces gate money and clubs are forced to make often unnecessary ground improvements. In the past winners have included Middlesbrough, Gretna and the legendary Bishop Auckland. Jarrow Roofing currently play in the second tier of the Northern League and after missing out on a promotion spot at the end of last season on goal difference, they wanted to go one better this season. So far, so good with 87 goals scored in twenty-three league games before today and tucked in just behind the promotion pack. Alas, today’s opponents were league leaders from the other side of the Tyne, North Shields, managed by ex-West Brom and Aston Villa player Graham Fenton, who had scored JUST the 92 goals and conceded 16. THis had 0-0 written all over it. 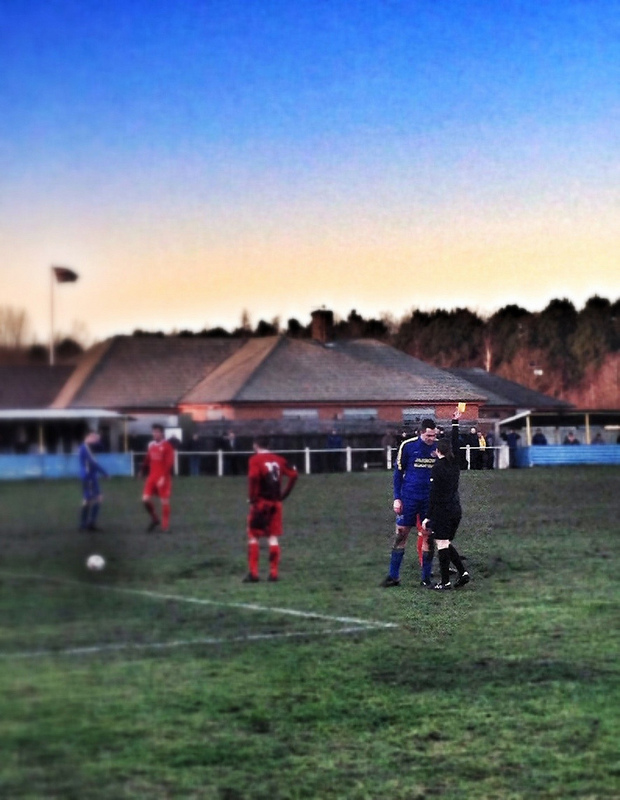 A war of words had broken out prior to the game between the two clubs. On the North Shields website they had posted that their fans would “outnumber the meagre home supporters by a very large margin”. Whilst this may be true, should a club publicly write such disparaging remarks about another local side. 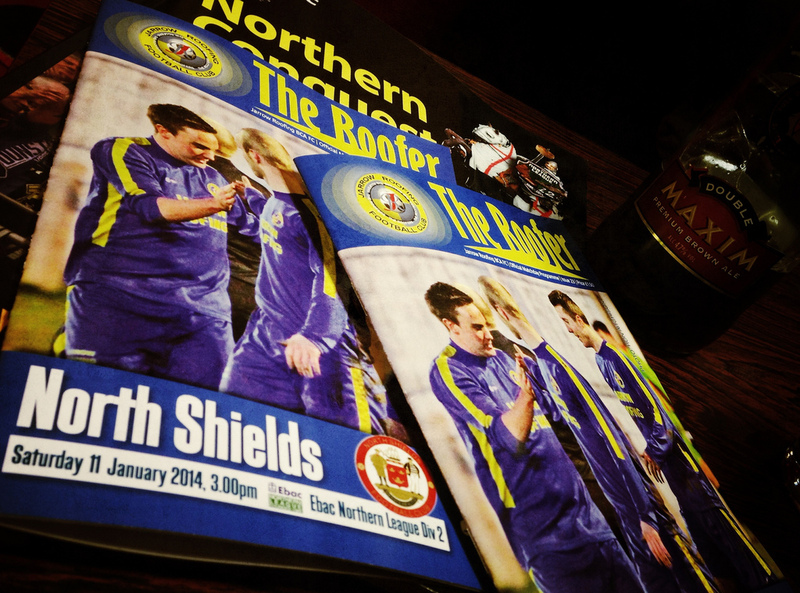 Not to let the matter drop, Jarrow Roofing bit back in the programme, saying that some clubs, North Shields included, seeing themselves as bigger than their current status Whilst the away fans did outnumber the home supporters, it was one loyal roofing fan who kept a 90 minute chorus up, summed up when he started singing “Can you hear the North Shields fans sing?” and one old fan retorted…”Of course you can’t; you wont bloody shut up long enough for us to start singing!”. 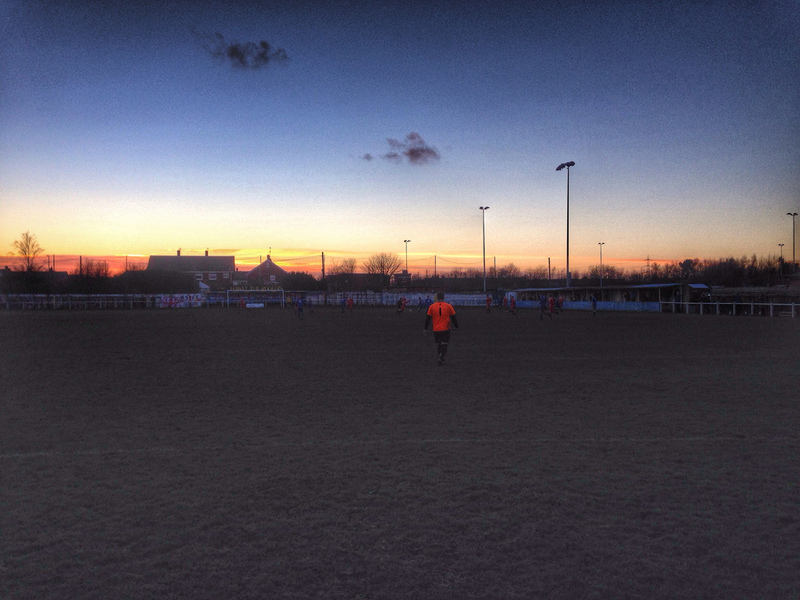 Jarrow Roofing 1 North Shields 2 – Boldon CA Sports Ground – Saturday 11th January 2014 Rarely do you see outstanding performances at this level, but this was an outstanding game of football. 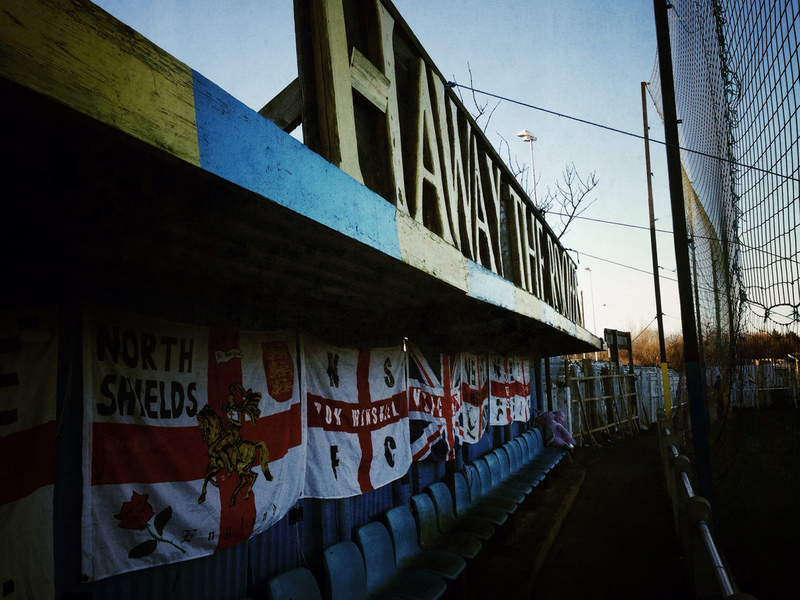 North Shields showed why they are red-hot favourites for the title with a dominant display which would have seen them break the 100 goal mark for the season if it wasn’t for the form of larger than live Roofing keeper Andy Hunter. I’d found out on the way up to Newcastle that the referee was to be Lindsay Robinson, who had officiated at a Charity Match I’d played in a few years ago and had subsequently interviewed a few years ago in the wake of the Keys/Gray/Massey saga. It’s rare that you watch a game knowing the official and I had pre-warned her I would give her some friendly stick. Her appearance confused a few of the fans who debated as to what insult they could use if required. “Way man, you cannot call the lassie a wanker. What about a fusser?”. “What’s a fusser?” asked another. “I have no idea but it rhymes with wanker”. They decided they would simply tell her to go home and cook the tea. Over the 90 minutes she performed well. In a weekend where so many top officials made big mistakes, she let the game flow – probably allowing a few choice challenges go when action could have been taken – but she certainly contributed to the game as a spectacle for the 155 people watching. The Roofing took the lead in the 13th minute when Liam McBryde volleyed home in the 13th minute. Could an upset be on the cards? Alas no. North Shields stepped up a gear, and after twice hitting the post they equalised when Dean Holmes smashed home a rebound from the woodwork. Half-time. All square on the pitch, bloody freezing off the pitch. We made our way around the ground to find a warmer spot. Behind one goal a large net dropped down to stop errant balls being lost in the field behind. The securing of the net was by guy ropes tied to the perimeter fence at throat level, meaning a dangerous walk around the edge of the pitch for everyone, including the substitutes. North Shields came out for the second period determined to take all three points and played some great attacking football that the home side simply couldn’t handle. Time and time again they found themselves in scoring positions only to find the hands, feet, legs, arms and belly of Hunter in the Roofing goal. Finally, he was beaten for the second time when a ball over the top found Bainbridge and he hit the ball across the keeper into the corner of the net. The subsequent celebration showed how much the goal meant and broke any remaining spirit the home side had. Full time and the best team had won on the day and any bad feelings between the clubs was soon forgotten over a couple of beers in the bar after the game. After a few weeks of experiencing the “premium” Non-League experience at Barnet and Lincoln City, it was brilliant to be back in the real grass-roots once again. Top marks all round for a great afternoon. Hartch was on hand to prevent almost certain death on our walk back to the metro, giving us a lift to the metro and before you could read out the full names of the Newcastle United squad, we were back in the hotel where the girls had emptied one of the free mini-bars (thank you Indigo hotels for your generosity). A night on the Toon beckoned.